Delicate elfins mark the opening of the spring butterfly season in New England. 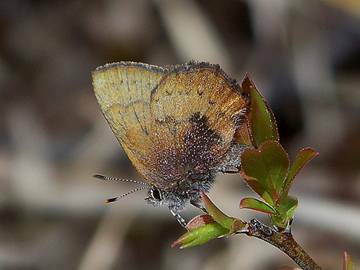 Modest and softly-colored, the Brown Elfin is a key species to look for on an April butterfly walk. Of the four deciduous-feeding elfins in Massachusetts-- Brown Elfin, Hoary Elfin, Frosted Elfin, and Henry’s Elfin-- Brown Elfin is the most common and widespread, and often the first to emerge. Our eight brown or green elfins (including hairstreaks gryneus and hesseli) are now in the genus Callophrys (Pelham 2008), but their taxonomic history is a frustrating tangle. Early lepidopterists labored mightily to classify the various “Theclas,” often confusing them. But augustus (later augustinus), was one of the more well-known and well-described species, even if the genus was subject to debate. Both Thaddeus Harris and Samuel Scudder had Massachusetts specimens. Scudder, following Kirby, called it Incisalia augustus, and until recently most lepidopterists placed the elfins in the genus Incisalia. In the 1990s Kurt Johnson re-examined the elfins world-wide and divided them into two groups based on larval host plants: the conifer-feeders and those that feed on deciduous trees and shrubs. He concluded that the genus name for the latter, which would include the blueberry-feeding Brown Elfin, should be Deciduphagus, and the name Incisalia should be applied to the pine- feeders such as the Eastern Pine and the Bog Elfin. The host plant distinction is supported by morphological differences. However, most lepidopterists continue to consider our elfins part of the broader genus Callophrys (Kirk 2003; Pelham 2008). Scudder wrote that Brown Elfin was “widely distributed and will probably be found in abundance over all the wilder portion” of New England (1889: 844). In addition to specimens from Maine and New Hampshire, where Brown Elfin was “common”, he cites Massachusetts specimens from several places around Boston (where it was “by no means rare”), as well as from Andover, Middleboro, Mount Tom and other rocky hills near Springfield, and from East Falmouth and Nantucket (where he himself had found it “abundant”). Aside from the specimen which Harris (1862) used for his early figure, the next earliest Massachusetts specimen might be that collected by F. S. Sanborn in Andover in 1868 (now in the Boston University collection). Prolific collector F. H. Sprague found Brown Elfin in Wollaston (now in Quincy) in 1878 (Sprague 1879) and in 1897 (specimen in MCZ). A. P. Morse collected it in Dover in 1891 and Wellesley in 1892 (specimens in MCZ), and C. Bullard found at least 13 specimens in Waltham in April and May 1897(MCZ). It was collected in Sherborn in 1901, Medford in 1902, and C. A. Frost collected it in Framingham in 1904 (specimens at BU). Since Brown Elfin uses dry heath-land habitats, which can be created or extended by fire, timbering and excessive grazing, this butterfly may well have increased in numbers during the eighteenth and nineteenth centuries as a byproduct of human agricultural and extractive activities (Table 1). Brown Elfin has remained fairly common throughout the twentieth century. Between 1900 and 1950, it was collected in at least 27 towns in eastern Massachusetts, as well as many locations on Cape Cod and in Essex County (Farquhar 1934). Locations included Tyngsboro (1919, 1921, H. C. Fall, MCZ); Weston, Wayland and Harwich in the early 1920's (C. J. Paine, MCZ); Walpole, Lexington, Wellesley, Middleboro, Watertown, Southboro, and Stoneham (C. V. Blackburn) in the 1930's (MCZ; AMNH; McGuire); and also Fall River and Falmouth (Yale; UNH). In the spring of 1942, V. Nabokov collected five specimens at Wellesley College in Wellesley (MCZ). On the islands Brown Elfin was "abundant in the early season" on Martha's Vineyard, and "very common on the moorlands" of Nantucket (Jones and Kimball 1943). Specimens exist for Nantucket (C. P. Kimball 1937-39, 1943) in the MCZ, AMNH, and Maria Mitchell Museums, and for Martha’s Vineyard (L. W. Cleveland, 1937) at Yale. The Brown Elfin’s hosts range-wide are numerous heaths (Ericaceae), such as blueberries, huckleberries, bearberry, labrador-tea, leatherleaf and sheep laurel. All are as quintessentially New England as the butterfly itself. In Massachusetts the main host seems to be lowbush blueberry (Vaccinium angustifolium). Schweitzer found it using both blueberry and huckleberry at Middlesex Fells in Medford in the 1990’s (Schweitzer 1992). The butterfly is often found around these plants on balds and power line cuts, and is never found very far from them. Eggs are laid on the host flower buds, and the larvae bore into and later feed on the flowers and the fruit. The host plant is also used as an adult nectar source. The Connecticut Atlas found eggs on lowbush blueberry in the wild. In Connecticut Brown Elfin has also been found in association with mountain laurel (Kalmia latifolia) by Schweitzer. Brown Elfin does not normally use highbush blueberry (V. corymbosum) (NatureServe 2010). The habitat is mainly areas of nutrient poor and acidic soils or “barrens,” where shrubby, ericaceous foodplants thrive, including dry uplands such as the "moorlands" of Cape Ann, fire-created "balds" and utility corridors, and heath lands and sand barrens on the coastal plain and Cape Cod. It can also be found in bogs and other acidic wetlands if a food plant is present. Like the Eastern Pine, Henry’s and Hoary Elfins, Brown Elfins can occupy even small patches of suitable habitat, especially if a larger occurrence is nearby. They are also found in large contiguous habitats, for example the New Jersey and Montague, Massachusetts, pine barrens, where they seem to fly freely through the habitat and fully occupy it. But they are not known for long-distance dispersal, and urbanized, or very open areas with no trees or shrubs, probably constitute barriers to movement (NatureServe 2010). The 1986-90 Atlas termed the Brown Elfin “locally common,” but that only tells us that it may be common within its particular blueberry-barrens habitats. The Atlas actually found the species in only 69 of the 723 blocs searched, making it “Uncommon” statewide. MBC sighting records 2000-2007 rank it in the “Uncommon-to-Common” category, along with Frosted Elfin and Eastern Pine Elfin (Table 5). These are the most frequently-seen of our six elfins. There is a small upward trend in MBC sightings per total trip reports 1992-2009, and strong fluctuations every few years (Chart 24). Statistics from MBC records published in the Massachusetts Butterflies Season Summary likewise show modest fluctuations: the average number of Brown Elfins seen on a trip in 2007 was down 35% compared to the average for all preceding years back to 1994, but was up 1% in 2008, and up 57% in 2009 (Nielsen 2008, 2009, 2010). In addition, an important list-length analysis of MBC 1992-2010 records found a statistically significant 87% increase in this species over that period (Breed et al. 2012). The especially high reading for 1999 is due to several large reports, from different observers, from outer Cape Cod areas (e.g. max. 146 on 5/1/1999 Wellfleet, A. Robb, J. Sones and T. Hansen), in what was probably a local population explosion. There was also a report with unusually large numbers from Martha’s Vineyard that year, but other locations around the state did not show unusually large numbers. 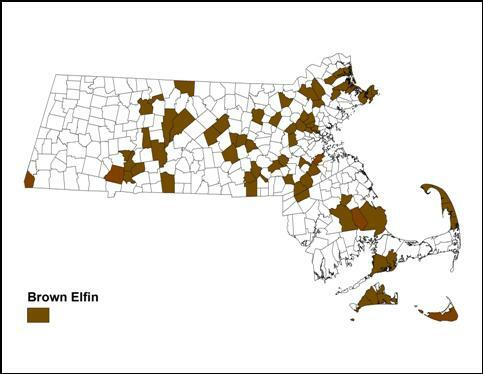 Brown Elfin is reported from 68 towns in 1992-2013 BOM-MBC records (Map 24), well-distributed across the state with the conspicuous exception of Berkshire County in the west. The 1986-90 Atlas had found Brown Elfin mainly east of Worcester and in the upper Connecticut River valley. BOM-MBC records corroborate this distribution but add the southern part of “the valley” and many towns in central Massachusetts west of Worcester. However there are virtually no records west of these towns. Brown Elfin does not appear to be normally found in most of Berkshire County because its habitat there is limited. The only report in MBC records is of 3 on 5/4/2000 on Mt. Everett (P. Weatherbee) in the town of Mount Washington. Similarly, the MAS Atlas had only two records from Berkshire County, both from the town of Mount Washington (5/2/1987 and 5/14/1987, E. Dunbar). From Martha’s Vineyard, BOM-MBC records show many reports, and the Vineyard checklist lists Brown Elfin as “Common" (Pelikan 2002), as it was historically. Similarly on Nantucket, where Brown Elfin was also historically common, reports and photographic records from Vern Laux in 2011 (e.g. 50 found on 5/4/2011), suggest that it is still abundant there. The 1986-90 Atlas also had a record from Nantucket (Siasconset 5/5/1988, W. Maple). From Cape Cod, there are many MBC and Atlas records. Mello and Hansen (2004) list many good locations for Brown Elfin on the Cape. Andover Ward Res Boston Hill, 8 on 5/11/2008 H. Hoople; Canton Great Blue Hill max 19 on 4/29/2003 E. Nielsen; Chelmsford power lines; Edgartown State Forest max 29 on 5/16/1999 M. Pelikan; Falmouth Crane WMA max 10 on 5/22/2009 A. Robb, and 8 on 5/11/2003 B. Walker; Gloucester; Lexington Whipple Hill max 5 on 4/25/2009 T. Whelan; Montague Turners Falls power line, max 6 on 4/4/2012, R. and S. Cloutier; Nantucket max. 50 on 5/4/2011, V. Laux; New Salem Quabbin Gate 35 max 15 on 4/24/2008 B. Bowker and L. Rogers; Plymouth/Carver Myles Standish SF recent max 45 on 4/26/2009 E. Nielsen, and 35 along Algonquin gas line, 5/7/2013, S. Moore and G. Kessler; Provincetown Beech Forest max 35 on 5/1/1999 by A. Robb and T. Hansen; Sherborn power line max. 10 on 5/7/2006 MBC B. Bowker; Truro Pamet 65 on 4/29/2001 B. Nikula; Truro High Head 42 on 4/25/2013, J. Dwelly; Wellfleet Wellfleet Bay WS max 36 on 4/18/1999 J. Trimble; W. Tisbury SF max 21 on 5/11/2003 M. Pelikan; Woburn Horn Pond Mtn max 12 on 4/26/2008 T. Whelan; Worcester Broad Meadow Brook WS max 13 on 5/8/1995. Like all of our six elfins, Brown Elfin is single-brooded, flying between late March and the end of May, with late-fliers into the third week in June in some years. MBC 1993-2008 records show it to be common from the 3rd week in April through the 3rd week in May (http://www.naba.org/chapters/nabambc/flight-dates-chart.asp). Earliest Sightings: A new early "first sighting" date was set in the warm spring of 2012 with a report of two Brown Elfins on 3/23/2012 on Horn Pond Woburn (M. Arey). The second reports in 2012-- 4/4/2012, Montague Plains, 6, S. Cloutier, photo, and Wellfleet Bay WS, 42, M. Faherty -- were also quite early (BOM records). Prior to 2012, the earliest known date had been a MAS Atlas report of 3/30/1981 in Millis, B. Cassie. In 23 years of BOM-MBC records 1991-2013, the five earliest "first sighting" dates are 3/23/2012 Woburn Horn Pond, M. Arey; 4/2/2000 at Truro, B. Nikula; 4/4/2010 Canton Great Blue Hill, S. Jaffe; 4/7/1999 at Wellfleet, J. Sones: and 4/10/2006 Cape Ann D. Savich. Over this 23-year period, four of the first sightings occurred in week I of April (4/1-4/7), seven of the first sightings occurred in week II of April (4/8-4/14), eight in week III (4/15 – 4/21), and four in the last week of April (4/22-4/30). Clearly, the first week of April is now a very likely "first sighting" time, and this is significantly earlier than the "middle" or "end" of April mentioned by Scudder. Latest Sightings: In the 23 years 1991-2013, the five latest "last sightings" are 6/20/2002 Sharon, B. Cassie; 6/10/2001 Northbridge, R. Hildreth; 6/8/2011 Falmouth, A. Robb; 6/7/1993 Montague, M. Fairbrother; and 6/6/2010 Falmouth A. Robb and 6/6/2009 Boylston W. Miller. In 9 of the 23 years, the last sighting was in June. In the remaining years the last sightings are earlier, in May. The Atlas also reported a late date of June 17, 1986, Medford [Middlesex Fells], D. Schweitzer. Flight Time Advancement: Scudder wrote that Brown Elfin “generally makes its appearance toward the end of April or very early in May,” but that “occasionally it is found shortly after the middle of April and generally begins to be abundant during the first half of June (1889: 845).” Scudder’s flight time statements in this case seem to refer to the region around Boston, because that is where the majority of his specimens were from. If that is the case, this species would appear to be emerging much earlier today than when Scudder wrote. The “abundance” in the first half of June which Scudder refers to is also not the case today; in fact, Brown Elfin tapers off and becomes rare in June. The whole flight period seems to have advanced since 100 years ago. A 2012 study at Boston University using MBC and Atlas data showed that Brown Elfin has indeed advanced its first flight appearance and overall flight time, at least in the years 1986-2009 (Polgar, Primack, et al. 2013; graph courtesy of Caroline Polgar). As the downward slope in Graph 24 shows, Brown Elfin is flying significantly earlier now than it did in the 1980’s (p = < 0.0001; significant at the .01 level). Analysis using all Brown Elfin sightings for 1986-2009, rather than just the first 20%, gave similar results, as did analysis using only the median flight date. Later calculations adding the years 2010-2012 indicated that Brown Elfin had advanced its flight date by more than 10 days over this period (Williams et al. 2014) Brown Elfin is also responding strongly to temperature variations in the two months prior to emergence (March, April), varying its flight time according to average temperature. This responsiveness to temperature is an adaptive trait. In this study, Eastern Pine Elfin also showed significant advancement in early spring flight time 1986-2009, whereas Frosted Elfin, Henry’s Elfin, and Hoary Elfin did not show advances over this period, but did over 1986-2012. Four of the five elfins studied showed strong overall flight time/temperature response. The exception was Hoary Elfin, for which the low number of observations may have affected the results. Although the Brown Elfin is ranked as S5, or “secure,” in Massachusetts (NatureServe 2010), its future is dependent on the persistence of its special heath-land habitat. Nearby Connecticut provides a cautionary tale of what can happen when sufficient heath-land habitat is not preserved or created. The 1990-95 Connecticut Atlas found that, with only 23 project specimens compared to 126 pre-project, Brown Elfin was “losing ground” in the state, along with Edwards’ Hairstreak which needs pitch-pine scrub oak barrens, and Juniper Hairstreak, which needs old re-growing fields (O’Donnell et al. 2007: 293). NatureServe suggests that strongly urbanized areas, or large open areas with no trees or shrubs, such as agricultural fields, act as dispersal barriers for Brown Elfin. Some of our colonies, for example at Horn Pond Mountain in Woburn, are surrounded by dense suburbs and may experience no new gene inflow from other colonies. In the eastern North America, the Brown Elfin ranges quite far north into boreal Canada (Layberry et al. 1998). It is found throughout northern New England and the northern Great Lakes area (but it is rare, for example, in Ohio), and then south to Georgia only at higher elevations in the Appalachian Mountains (Opler and Krizek 1984). It is not found along the Gulf coast or in Florida. This northerly and higher-elevation range suggests that this butterfly could be adversely affected by climate warming (Table 6), but thus far it appears to be increasing rather than declining (Breed et al. 2012).